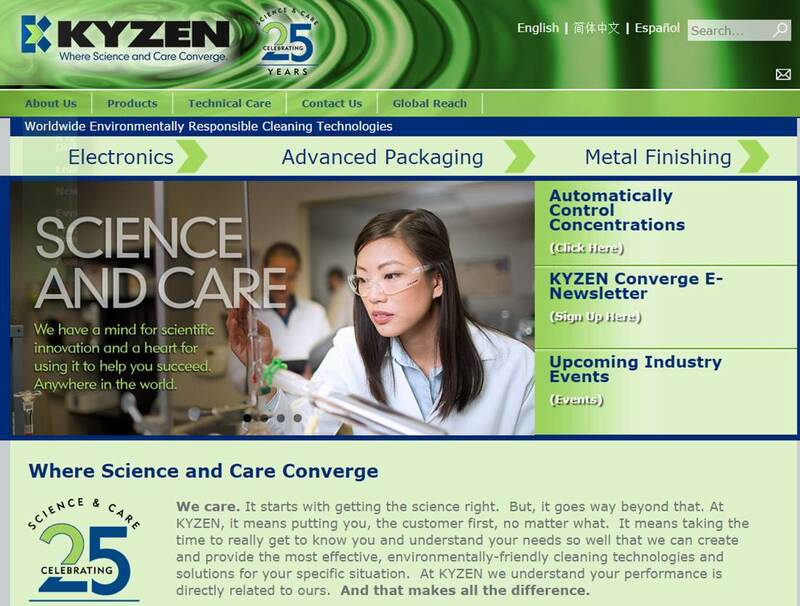 KYZEN Corporation is a global leader in the development of environmentally responsible cleaning technologies for the Electronics Manufacturing and Metal Finishing Industries. Look alike brands filled the market. Improved lead generation and nurturing for their technical audiences around the world was needed to fuel growth. Voice of the Customer: In-depth personal interviews to better understand customers (mostly engineers), prospects and KYZEN management in Asia, The Americas, Europe and China. Discovered KYZEN’s distinctive winning brand components, primary purchase motivators, road blocks and even emotional drivers. In less than 90 days, qualified lead inquiries, from English, Chinese, and Spanish markets, grew over 600%. With a focus on authenticity and accessible, marketing automation programs were launched to help the customer feel it was coming from a KYZEN representative. These programs are consistently producing inbound calls where the KYZEN representative is being asked for by name, as if they are personally known. With the new website, traffic sustainably grew by 60%. This growth in traffic was due to the SEO efforts that grew the organic search traffic by 50%. Direct traffic ramped by 2X. Referral traffic increased by 120% and traffic from Social channels improved by 65% with no advertising. By combining improved data collection strategies and marketing automation process, KYZEN’s email campaigns and engagement sustainably grew. Through the development of a strategic roadmap, a new marketing organization structure has been established, in which global segment leaders are being onboarded.